A murder motivated by vengeance for a horrific crime, the conflict and pain of rejection, the desire to leave a small town behind. These are powerful components for a work of fiction, and what makes THE FEMALE OF THE SPECIES even more remarkable is that it’s a young adult novel. “An astoundingly dark but beautifully written tragedy, brimming with sexual assault, violent murders, and accounts of animal abuse…but also tempered with glimpses of genuine human emotion and extremely touching displays of kindness that cross social barriers and species,” says School Library Journal in its starred review. 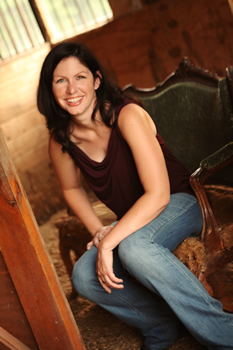 Mindy McGinnis, an assistant librarian who lives in Ohio, is also the author of A Madness So Discreet, which won the 2016 Edgar Award for Young Adult Fiction, as well as Not a Drop to Drink and In a Handful of Dust, the first of which has been optioned for film by Fickle Fish Films. McGinnis shares her thoughts on writing with The Big Thrill. 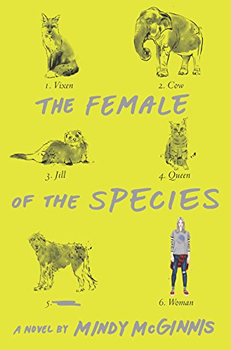 THE FEMALE OF THE SPECIES has an anthropological sound and it’s definitely a novel that captures the details of human life. Do you ever think that being a novelist is a little like being an anthropologist in studying behavior? In many ways, yes. I think being a keen observer of humanity can often lead us to some dark places, or at least some depressing ones. To me, that means it’s all the more important to bring illumination to those corners. We can’t fix things that have gone wrong, or off-course, with humanity, if we don’t first understand it. Did you base the darker events of the book, the crimes, on any real life events in the news, or is it purely from your imagination? You fully inhabited the life of the small town in this book, the working class county. Have you ever lived in that kind of place? Born, bred, raised, and current resident. There are many beautiful reasons to choose to live rurally, or in a small town. There are plenty of cons as well. I think this is true of any location, but rural poverty does pose a different set of complications than poverty in suburban and urban areas. I talked about that in some depth in this interview. The book is told from the points of view of three teenagers: the outsider and the sister of a murdered girl, the daughter of the town preacher, and the high school athlete. Which was the hardest to write? They each brought their own complications. Jack was my first experience writing from a male POV, so it was important to me to get that right. I had multiple male beta-readers to ensure that I had a close approximation of the male high school experience. Alex was of course a challenge because I’m writing a homicidal revenge-killer who has to be sympathetic to the reader. I talk quite a bit about the fantasy of violence (who hasn’t daydreamed about punching their boss?) versus the actual experience or action of violence and how the two differ completely. 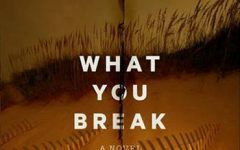 Alex will certainly represent wish-fulfillment to a lot of readers, but she also serves as an example of how violence damages the perpetrator as well as the victim. Honestly, Peekay was a relief to write. I’d finish an angsty, desperate Jack chapter, move to a rage-filled, black-emotion focused Alex, and then get to Peekay, who uses humor as a defence mechanism. Even though she’s a complicated character, I was always glad to see her, and her chapters were the easiest. Without giving anything away, the end of the book startled me. Was it your chosen destination from the beginning of working on this novel? I don’t plan anything, making the story up as I go along with a few plot benchmarks to guide me. I was nervous as I drafted because I didn’t have an ending in mind, and I knew it had to be pitch-perfect in order for the book as a whole to work. An ending coalesced for me as I moved forward, and I think it’s the right one. How do you think vengeance and justice intertwine? Justice, at its core, is the action of retribution. It becomes vengeance when the person executing justice is personally and emotionally involved. I think this stands true whether inside or outside of the judicial system. You’ve been a YA author as well as a YA librarian and blogger. How have you seen YA evolve? Trends are always smacking us in the face, from vampires to dystopian to cancer to fairy tale re-tellings, with both great and sub-par examples from all of these. However, there have always been plenty of socially-conscious contemporary titles to choose from, even when I first became a YA librarian 15 years ago. I have seen that arena growing lately, which I think is a wonderful thing. My next release is Given to the Sea, the beginning of an epic fantasy series set on an island country where the rides are rising and the differing cultures are warring over available land. 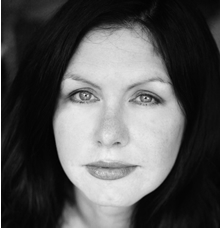 She is the author of A MADNESS SO DISCREET which won the 2016 Edgar Award for Young Adult Fiction, as well as the post-apocalyptic duo NOT A DROP TO DRINK and IN A HANDFUL OF DUST, the first of which has been optioned for film by Fickle Fish Films. To learn more about Mindy, please visit her website.